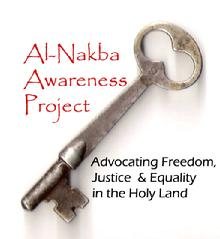 This project We believe Middle East peace will come only through recognizing and correcting over six decades of dispossession imposed by force upon the indigenous Muslim, Christian, and other Arabic peoples of Palestine. Peace cannot bypass justice. We advocate a solution based upon principles of democratic equality, the Universal Declaration of Human Rights, and international law, including the unequivocal right of return for over 4 million UN-registered Palestinian refugees dispossessed, exiled or confined to poverty in UN-administered refugee camps. As the origin of the conflict, we believe that awareness of the Nakba, the Palestinian catastrophe, is critical for understanding the problem. Israel’s original goal and its ongoing strategy of “nishul” – displacement or dispossession in Hebrew – remains unchanged since 1948 and has blocked resolution for many decades.